Written by: Jessica Greenlee on September 11, 2013. In the last issue of Weirding Willows Frankenstein’s monster wandered into the Weir looking for his pet dinosaur. He was not impressed with the welcome he initially got (pitchforks featured prominently). 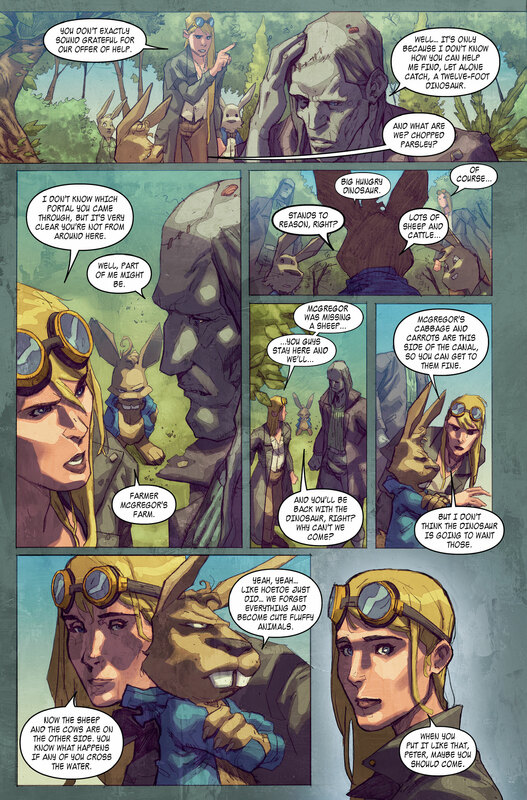 This issue finds him even less impressed with Alice’s subsequent offer to help him. What can one young woman and a bunch of little animals do? Alice, however, is determined, and while the animals may be too small to be much help they can figure out where the dinosaur is likely to have gone: Remember Farmer MacGregor’s missing sheep from Weirding Willows #1? It wasn’t Dr. Moreau’s doing. Meanwhile, Dr. Moreau has plans for Baheera, big, and probably unpleasant plans, and it looks like the Cheshire cat may have plans for Mowgli. Given his grin, they probably aren’t pleasant either. Oh, and Badger’s been keeping a secret. Things really get moving here, with multiple plots sharing the pages. The transitioning is rapid, and the outlines of an overall plot are starting to take shape. There are now at least two significant quests underway—Mowgli’s and the monster’s–plus the ongoing dilemma of animals forced to stay in a small area if they want to keep their intelligence, and Alice’s perhaps as-yet unrealized need to escape the same territory. As far as that last goes, I am curious about her decision to stay where she is when she clearly knows of portals to other worlds. Is it because whatever out there is worse? Because of her friends? Family ties? Or is she just not ready yet? I’m looking forward to learning more about her past adventures as well as seeing what is coming in the future. Also, I approve of the T-rex. 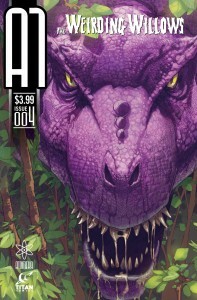 There’s nothing like a big, fanged, purple T-Rex to add a little color to the countryside. 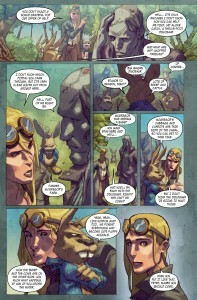 Note: The Weirding Willow ; #’s 1-4 are individually available through ComiXology. 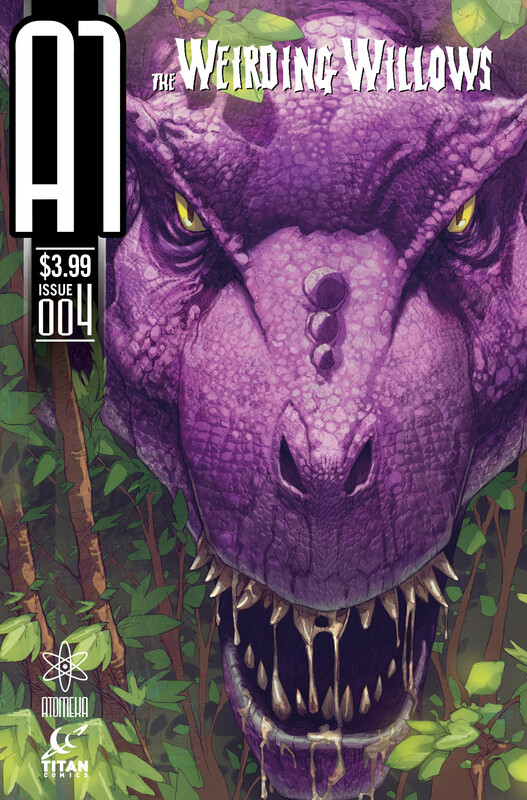 A1 #4 is in print now. Also up is a map of the Weir.